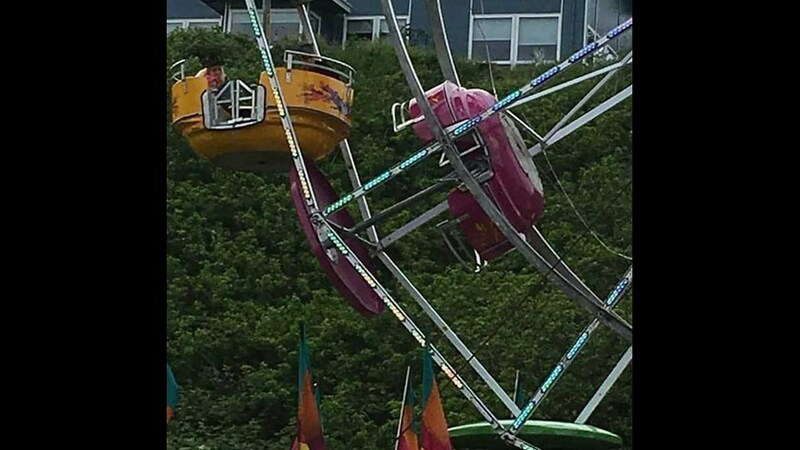 Two adults and one child were injured after plummeting from a metal Ferris wheel at a festival in Port Townsend on Thursday. All three were riding a carnival attraction at Port Townsend's annual Rhododendron Festival carnival at Memorial Field. A 59-year-old woman was airlifted to Harborview Medical Center in Seattle with severe injuries including fractures and head trauma. Officials at the hospital reported that she was in critical but stable condition. A 7-year-old boy and a 47-year-old woman also suffered injuries and were transported to a local hospital. According to a fire department investigator, "The women took the brunt of the fall. The other people fell on her." All three fell between 15 and 18 feet after being ejected from the ride. They plummeted to a metal deck below the structure. Witnesses saw the Ferris wheel bucket that all three were riding in spin around, causing them to be thrown out. Eyewitness reports to fire department investigators revealed that they heard a grinding sound, and then the bucket “flopped upside down.” The victims tried to hold on as the bucket tipped, but were unable to stay inside the bucket. The bucket remained stuck upside down as investigators arrived at the scene to check it. Eyewitnesses reported that it looked like a pin or a section of the metal ride had detached before the accident. After the accident, it took approximately one hour for ride operators to get everyone else off the Ferris wheel. Rhody Festival Vice-President Brandi Hamon and President Debbie La Follete both had children stuck on the wheel at the time of the accident; they released a statement thanking volunteers and employees for stepping up to care for the victims and handling crowd control during a tense situation. The festival was contracted out to The Funtastic Carnival Traveling Shows, which operates the faulty Ferris wheel and other rides. Funtastic had been in operation for over 60 years, and President Ron Burback told reporters that this is the first such incident in the company’s history. Investigators returned to the scene on Friday to continue their work. Injuries at an amusement park can be especially traumatic for victims. In addition to recovering from their physical injuries, they must overcome their emotional trauma after being hurt in a place that they believed was safe. Many visitors at amusement parts are young children, and child injuries can have complications that last into adulthood. Who was legally responsible for maintaining and operating the ride? In many cases involving seasonal festivals, the company that owns and operates the equipment is not the same company that organizes and advertises the festival. It’s possible that you can file a claim against one or both of those companies. Does the owner of the ride have a history of previous safety issues or injuries? Not every safety-related incident is reported in the media. A personal injury lawyer might discover after digging into a company’s records that its rides have a long history of malfunctions and breakdowns. Who manufactured the ride? It may be the case that a piece of defective equipment wasn’t made by the company that currently owns it. You may have a claim against the company that designed and manufactured the parts of a ride, even if a different company operates it. Was anyone aware of the potential safety issue before you were injured? Sometimes, during an investigation, it’s revealed that employees or safety inspectors had already warned a company about potential problems, but that company chose to ignore them and continue operating the ride. Filing an insurance claim against an amusement park or seasonal festival can be a difficult process for an injured victim. It’s not always easy to figure out who was responsible for operating and maintaining a ride just by visiting a festival. Most people aren’t familiar with the types of defects that can be caused by improper setup, storage, and maintenance of rides like Ferris wheels; it’s difficult to understand where to begin when you need to file a claim for damages. An experienced amusement park accident lawyer can help you navigate this difficult process. If you have any questions about an injury at an amusement park, Davis Law Group’s award-winning team is ready to help you. You can speak with our legal team at any time by using our convenient chat feature, visiting our contact form, or calling (206) 727-4000.